Learning another language is a long process, and it is different for everyone. There is no such thing as a fool-proof method. While we all may learn differently, there are some things that are universal. 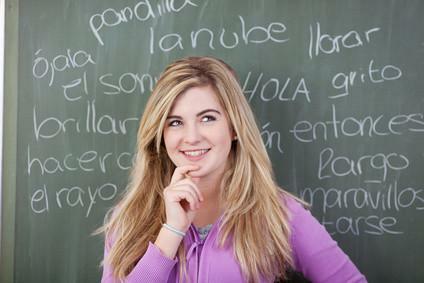 Some or all of the following nine principles can help you become fluent in your second, third, or fourth new language. The number one reason why people fail to learn a new language is because they do not make enough time to learn the language. It is not something you can do on a whim. If you miss a day of studying, that’s a pretty big deal. If you miss two days of studying, there is a serious problem. Missing days is only ok if you know about them ahead of time. Missing days because you don’t have the time is not an acceptable reason to miss. There are so many ways to make time. Especially with today’s technology. The amount of time you dedicate to learning is going to play an incredibly important role in your success. In the beginning you are pretty much going to be required to spend time with books, audio, and apps that contain very rigid content. It is not much fun. Imagine you are standing at the base of a mountain looking up. You really want to scale it, but that first part is the hardest. The further up you go, the more likely you are to continue. Pacing yourself is critical. It is the same for learning a language. You have everything to learn in the beginning, and it is intimidating. By working at it every day, you will start to see progress. Your memory retention will be much better than that of someone who frequently misses days of studying. Remember, you can work in small increments. While you are on your coffee break, waiting in line at the store, or driving home are all perfect times to study. It is so easy to work studying into your day (or better yet, build your day around studying). When you first get started, you do need to plan to have quality time to learn, not just short spaces of time as you can make them. You are building the foundation to learn a new language, and it needs to be strong for you to succeed. It was a tossup whether to put this reason first or second. Since most people fail to make the time to study, motivation comes in second. I cannot overemphasize how important it is to stay motivated to keep learning. Learning a language is a time-consuming and sometimes frustrating adventure. However, it is an adventure. At the end of the line, you have a world of possibilities in being able to apply what you have learned. The easiest way to stay motivated is to always remember why you want to learn a language in the first place. Once the enthusiasm wears off, you are going to have to continue to really work hard. Knowing why you are doing it will help you stay motivated to keep going, no matter how many obstacles you encounter. In the beginning, this is absolutely essential. Small chunks of time over the course of the day can help, but you need dedicated, quality time to fully grasp concepts. Save the small spans of time for vocabulary building. You also need to stay within your current abilities with a slight challenge to expand what you know. Dedicate between one and three longer intervals of time to study (10 to 20 minutes) over the course of the day. If you can do one complete 30-minute interval every day, this will help you learn a lot faster than three 10 minutes sessions over the course of each day. You are also a lot more likely to do the full time instead of saying “good enough” if you finish two sessions. In the beginning you need dedicated time, but you also need to do it often. The further you progress in the language, the more important the quantity of times you study becomes. Of course, the more you study at whatever interval you choose, the more your brain is required to think in terms of what you have learned. Quantity includes passive activities, such as listening to a podcast while jogging or watching a TV show in the language. When you first get started, you will be limited in what you can do. But there remains a variety of available activities that can help keep your mind engaged. The more diverse the activities you use in your studies, the more links and associations you form with what you have learned. Variety goes beyond just activities though. Try to make sure you shake up your learning. Change up your materials. From flashcards to apps to writing and reading, you need to have a lot of tools at your disposal. The more varied your activities, the more engaged you will remain in wanting to learn. If you don’t feel like using flashcards, continue to study those words by using them in a paragraph. Reinforcement doesn’t have to use the same tools. Keeping a variety of activities available is incredibly important. You should be talking to people, reading, writing, playing games, and doing book studying. This one is very easy and can really help you with reason #2 – staying motivated. If you stave off boredom, you will want to keep coming back for more. Change your position. Use multiple pieces of technology to keep you learning on your favorite app, but from wherever you may be. Also, you don’t want to get accustomed to only thinking in the language from a desk or table. The more varied your position, the more associations you create (as well as the more comfortable you can be as you learn). The way you learn language is really specific to you. If you know your best learning method, you need to use that approach consistently. You will learn at a different pace than everyone else. That is ok. As long as you are consistent and work in a way that maximizes your learning receptors, the faster you will learn. Over time, what works is going to change. That is also ok. You will need to modify your approach as you become more familiar with the language. Just make sure you continue to grow and adapt based on your current ability and skills. Learning a language is challenging for everyone, no matter how many languages they already know. You have to keep a positive attitude to succeed because it affects every other principle. You are bound to have bad learning days. It’s fine – it happens to everyone. Don’t let it get you down. You are going to make mistakes. You will feel a bit stupid, that too is fine. Even a bit endearing. Learn from your mistakes and problems instead of letting them stop you. The people who learn the fastest are the ones who are the most motivated, and they are almost always incredibly curious about the culture of the language they are learning. Curiosity will help you get through rough times and motivate you to keep going. Do some research into a particular aspect of a country that speaks your new language. Find out things you would like to learn. It’s also a fantastic way to push your vocabulary in a new direction. Learning a language is not like any other kind of learning you have done (since you learned English). You have to be flexible and figure out what works for you for . It isn’t going to be what worked for your best friend, your teacher, or even a sibling. Heck, if your second language is German and you want to learn Japanese, you had best be ready to study in a completely different way. The difference between English and German is pretty easy to overcome (because English is a low form of German). Learning Japanese is nothing like learning German for English speakers because virtually nothing is the same. No language is too difficult to learn. You have to be flexible in how you learn. This is true even several months after you start learning a new language. The more you know, the less effective the old methods are going to be. You have to move from primarily studying with a book to actual conversation. Flexibility is required throughout the entire process. This does not mean scrapping your core method of learning. It simply means you are going to have to evolve your methods according to where you are and what works for you.